If there is one event that signals the winter festive season in New York, it is the lighting of the Rockefeller tree. This season it was to be on Dec 3rd. And of course, I wanted to go and watch the tree come alive in all its glory. But alas, it was not to be. NY police barricades to control street protests against police actions that question even the motto of ‘Courtesy, Respect, Professionalism’, had effectively prevented any public access to the tree lighting ceremony. Did the shadow of the conflict between the police and mayoral institutions put a pall on the city’s annual festivities? Or was it just my imagination? Anyways, I was happy to escape from the cold, literally as well. Adding to my thrill was an invite from an old old friend (no, the friend is not old; only that our friendship goes back a long way!) had invited me to go visit her in her hometown in Kerala. The plan was to combine some local sightseeing with all the catch-up from the past few years. An excellent start to a new year! 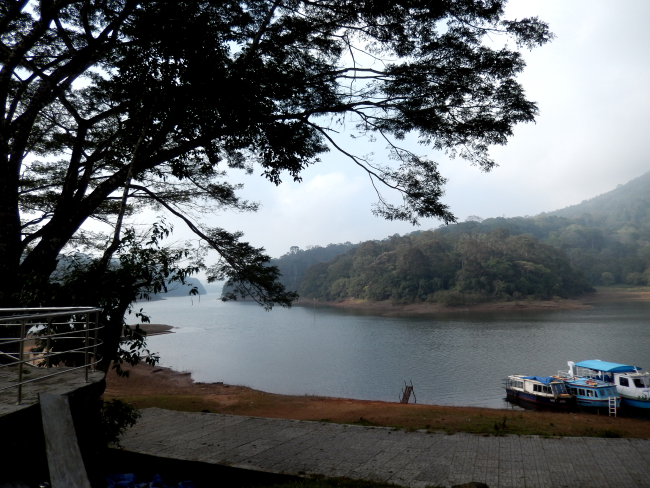 The first stop on our travel was Periyar National Park and Tiger Reserve at Thekkady, on the border of the southern Indian states Kerala and Tamil Nadu. 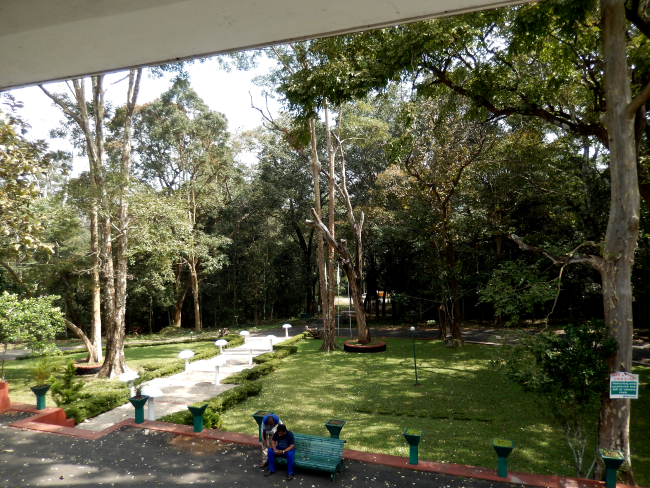 Formerly known as Periyar Wildlife Sanctuary, it was declared a national park in 1982. 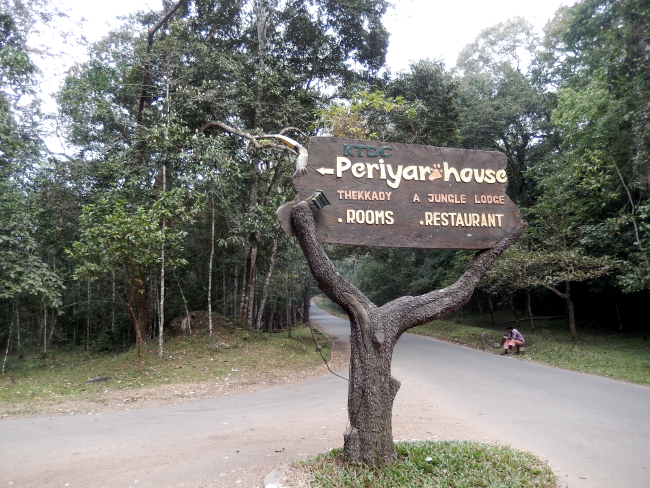 We had booked rooms at the Periyar House, within the boundaries of the park. What awaited us at the entry gates to the park was bad news… no vehicles are allowed inside after 5.30 pm! And we were about three hours late! The security guards assured us that this was for our own protection as the wild animals tend to wander at night, and may not like our presence. They told us stories of how a herd of a dozen elephants had gone up to the doors of the Periyar House on New Year’s eve. But then we saw many vehicles being let inside. Those are forest guard trainees and they live inside the park as well, we were told. We couldn’t imagine any wild animals that would selectively attack only visitors, leaving the forest guard trainees alone. So we decided to argue our case. After much telephoning over the next hour, finally we were allowed to enter, with the warning that we should get to the guest house and go in with the least amount of noise. 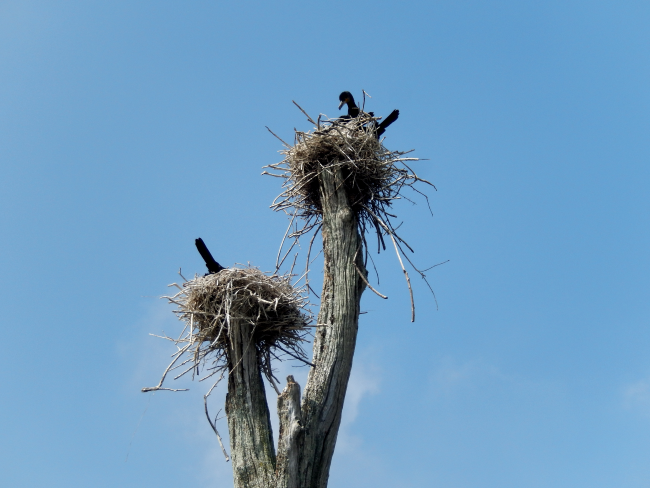 Along the mile-long drive to the guest house, we looked around with anticipation… to no avail. No elephant, no tiger, not even a wild squirrel! Was it a harbinger of things to come? 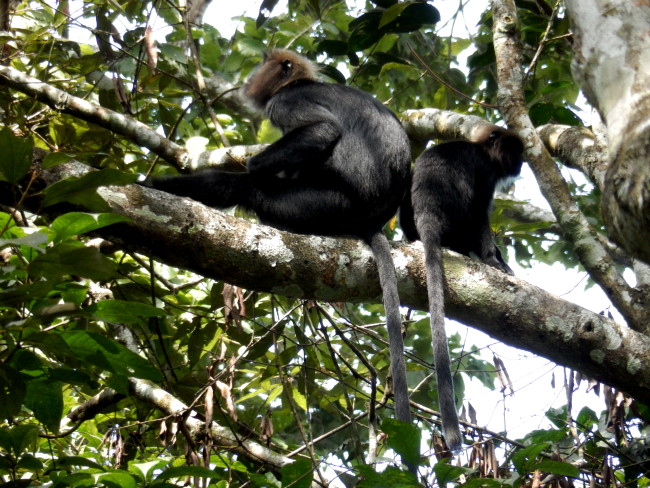 Periyar National Park covers an area of 300 sq. miles, most of it covered by evergreen forests. 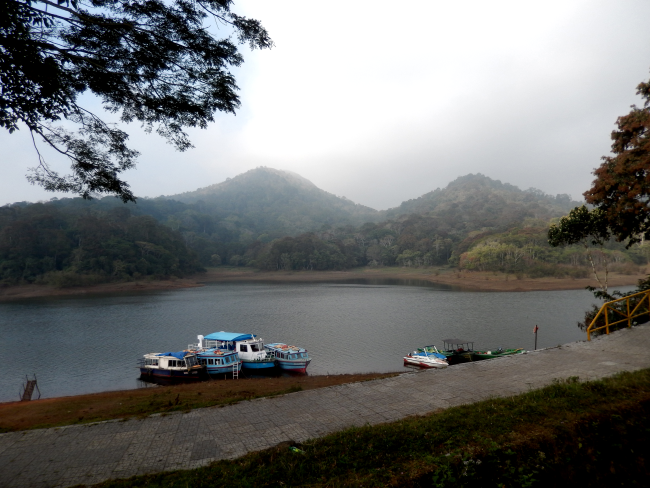 The central attraction of the park is an artificial lake, formed when a dam (Mullaperiyar) was built across the Periyar river. A boat ride on the lake is a ‘can’t miss’ activity when you visit the area. I have seen innumerable photos of elephant herds frolicking in the waters of the Periyar lake, brought back by visitors. So it was with heightened anticipation that we got on the boat the next morning. And, if we were lucky, we could even see a couple of the majestic Bengals… of course, of the tiger variety, not Cincinnati! After all, the area has a population of over 40 adult tigers! 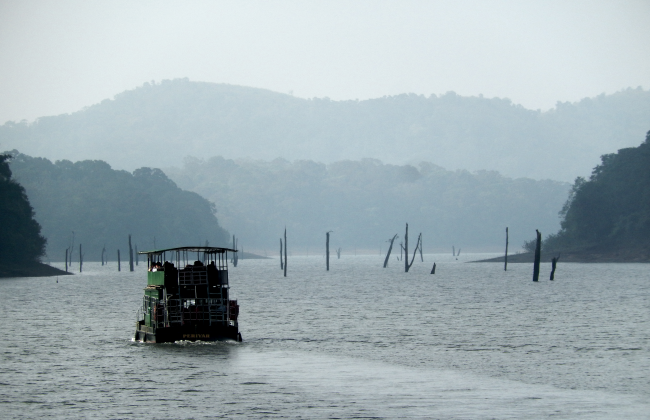 The enchanting view of layer upon layer of mountain ranges surround you as you embark on the boat ride. Stumps of the trees that got submerged when the lake was created can still be seen sticking out of the waters of the lake. Water birds find these tree stumps ideal for nesting. For the entire boat trip, our eyes scanned the shores looking for animals come to drink from the lake. No luck whatsoever! All we saw were a few wild boars on a far shore, that too, only for a couple minutes. As we got off the boat, I could hear mutterings… ‘maybe it was too hot for the animals’, ‘maybe another day’… yeah, maybe another day. 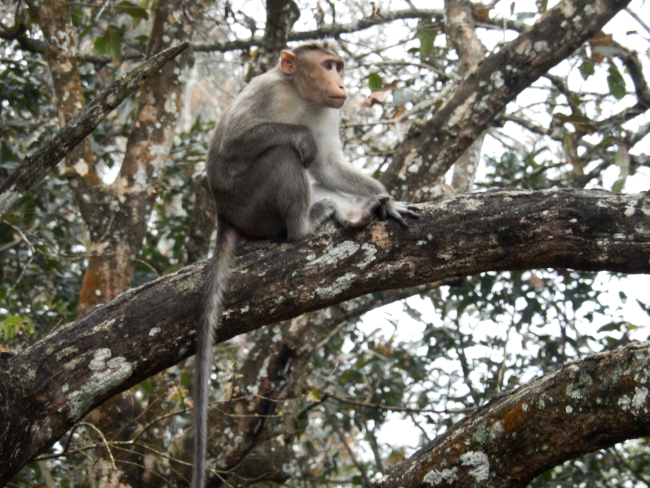 Though 35 species of mammals live in the area, the only ones we saw were bonnet macaque monkeys and Nilgiri langurs. The bonnet macaques, called so due to the tuft of hair on their heads that resembles a bonnet, are very common here. 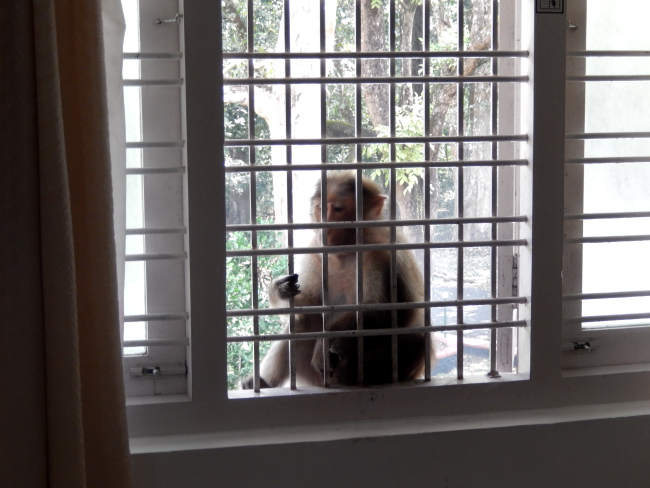 We even had one visit us at our room window, probably looking for a snack! The area is well known for its 143 species of orchids, in addition to a wide variety of other flowering and medicinal plants. The concept of ecotourism is taking strong roots in Periyar National Park with programs being run with involvement from the local communities. 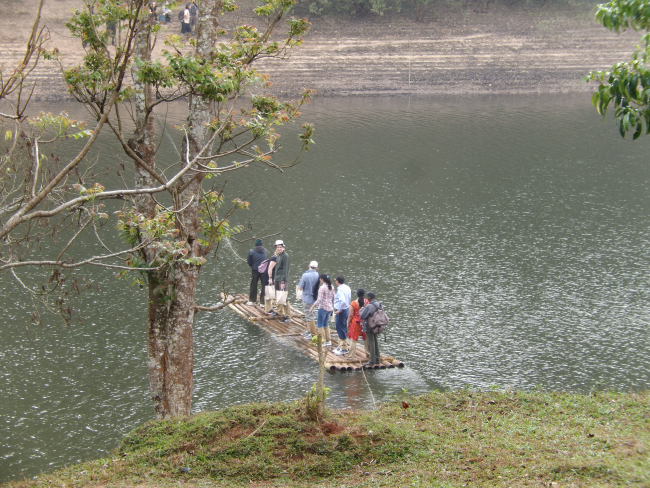 Among the wide variety of activities are bamboo rafting, nature walks, guided treks, adventure trekking and camping. For me, surely there is gonna be a next time… elephants willing! Loved the piece…..Enjoyed the shots..(The birds on the stumps looked like sculpted pieces).Scenic beauty aptly portrayed..Laughed a lot over ‘wild animals selectively attacking only visitors’……….. .
as poetic and nostalgic ( not the absence of Elephants, but your oeuvre ! ) as ever…..
Beautiful pictures, hope I can visit sometime.